Home Costs > How Much Does Parking Lot Striping Cost? Parking lot striping can be done for a variety of reasons, but more oftentimes than not, it’s done either to replace fading lines or if a new parking lot is being installed. Experts recommend replacing the parking lot stripes every 24 to 36 months. Painting these lines, when done correctly, can help keep a professional appearance, prevent accidents and even protect pedestrians. How much does parking lot striping cost per foot? 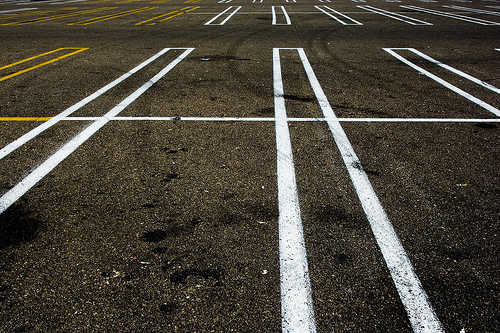 The average cost to stripe a parking lot will vary depending on a variety of factors, including the quantity of the pavement markings and whether or not the parking lot is brand new and needs new stripes or it simply needs to be re-striped. Most professionals, from what we researched, will always charge a minimum fee, regardless of the job size to cover labor, fuel, paint, equipment and the typical overhead costs. This fee, depending on your geographical location and distance traveled, can range anywhere from $300 to $600. These fees, of course, would be applied toward the total job. This table, hopefully, can offer you a better idea of what it may cost you. For exact costs, we highly recommend using HomeAdvisor.com to find reputable contractors in your area. With this tool, you can simply describe your job and contractors will contact you with bids at no cost. The writer of this ParkingLotStripingBusiness.com blog post said the first thing he does when he arrives at a location is count and record the number of four-inch lines in the lot as, according to the post, these will be the lines that will make up most of the jobs. From there, he will count up these lines, multiply it by $4, and then, calculating the linear footage, he will multiply it by another 20 cents. After this, the next step is looking for additional painting requirements, aside from the lines, such as the stop bars, arrows, light bases and bumpers, and depending on the item, the costs can vary. This blog post, written from a contractor’s point of view, can show you what you should expect when a contractor bids on your parking lot striping project. Joe Pullaro, Inc., a commercial painting contractor based in Tampa, Florida, lists his prices on his official pricing sheet. The prices, as seen in our table above, will greatly depend on what needs to be done. A four-inch stall line will cost $3 each, while a 12-inch digit will cost $2 each. His pricing sheet could offer a real-life example as to what a contractor may charge. In a lot of cases, potholes may need to be patched in order to paint properly. The costs will depend on the pothole size and the cost of the asphalt. If any logos, arrows and/or symbols need to be customized/drawn can increase the costs as the contractor will need to create a stencil for the project. Touching upon the costs mentioned a bit above, if any curbs or bumpers need to be painted, this can increase the costs and will greatly depend on the size of the curb. Before the striping, some opt to have the lot seal coated ahead of time, which on average, can cost $0.20 per square foot. Contractors will use two different types of pain: either an oil-based paint or latex. Oil-based paints are usually reserved for restripes and new layouts, whereas a latex-based paint will be used for a resurfaced lot, but it can be used for new layouts and restriping, too. A new line, according to Rmaces.org, when done, should be at least 15 mils thick, usually done in two coats.